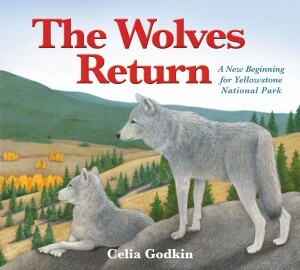 “Celia Godkin relays the awe-inspiring true story of the release of 23 Canadian gray wolves into Yellowstone National Park in 1995 and 1996…. Since the time of the release, the wolves thrived and the process created beneficial changes to the park’s ecosystem…. The illustrations are beautifully done in pencil crayon and watercolour…. [Godkin’s] telling of this true environmental success story is well told and inspirational. It is important to relay such stories. The end of the book has the fascinating history of the wolf in North America with a map. “We are always amazed at how much we learn from children’s non-fiction books. This one is an educational and excellent portrayal of the value of wolves in maintaining a healthy wildlife and ecosystem. Who couldn’t love this book about the value of wolves? From the pencil crayon and watercolour illustrations to the beautiful text, it’s an amazing book for both adults and children. It highlights how very important are all creatures and how one animal alone contributes to a thriving natural world…. The colourful illustrations will certainly appeal to children, especially those who are already animal lovers. I appreciate the information pages regarding the history of wolves in North America. I can’t say enough about this beautiful book that contains such important life lessons. I highly recommend it. It’s a sad reality that most city children have never seen live wild animals (except perhaps at the zoo) or know much about them. Both my son and I were surprised by how much we enjoyed and learned from reading this book. With clear informative text and beautiful illustrations, the author has succeeded in teaching us that large predators play a vital role in the health of the ecosystems where they live…. Children who are animal lovers will especially enjoy the depictions of the various animals…My son and I enjoyed this book and we especially liked that on the front and back inside covers are the names and illustrations of all the plants and animals in the book.